The Conflict Paradox is a guide to taking conflict to a more productive place. Written by one of the founders of the professional conflict management field and co-published with the American Bar Association, this book outlines seven major dilemmas that conflict practitioners face every day. Readers will find expert guidance toward getting to the heart of the conflict and will be challenged to adopt a new way to think about the choices disputants face,. They will also be offered practical tools and techniques for more successful intervention. Using stories, experiences, and reflective exercises to bring these concepts to life, the author provides actionable advice for overcoming roadblocks to effective conflict work. Disputants and interveners alike are often stymied by what appear to be unacceptable alternatives,. The Conflict Paradox offers a new way of understanding and working with these so that they become not obstacles but opportunities for helping people move through conflict successfully.. Conflict is everywhere, and conflict intervention skills are valuable far beyond the professional and legal realms. With insight and creativity, solutions are almost always possible. For conflict interveners and disputants looking for an effective and creative approach to understanding and working with conflict , The Conflict Paradox provides a powerful and important roadmap for conflict intervention. BERNARD MAYER, PHD, is an internationally recognized leader in the field of conflict intervention. He is Professor of Dispute Resolution at The Werner Institute at Creighton University and was a founding partner of CDR Associates, an internationally acclaimed conflict intervention and training firm. His background spans family mediation, public and private sector consultation, environmental decision making, organizational conflict, and international mediation. His previous books include Beyond Neutrality, Staying with Conflict, and The Dynamics of Conflict. 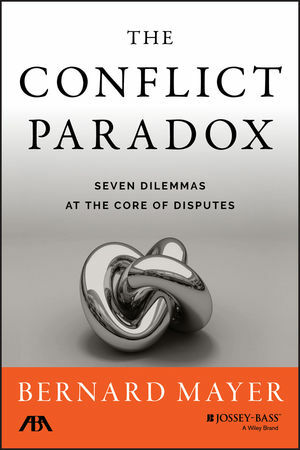 "In his new book, The Conflict Paradox: Seven Dilemmas at the Core of Disputes (2015, Jossey-Bass), Bernie Mayer explores the mystery of this complexity in the context of conflict engagement. It is an enjoyable and fascinating read for everyone involved in negotiation, mediation or any form of conflict engagement."